A teacher who has used photography to build student engagement notes particular benefits for students on the spectrum. One of the author’s students frames a shot with her camera. I’ve been a teacher for 16 years and have worked with students with a variety of disabilities, including autism, dyslexia, anxiety, nonverbal learning disabilities, emotional and behavioral challenges, and ADD/ADHD. A key strategy that I’ve used to engage students—with and without disabilities—has been photography. I’ve introduced it in informal ways in mini-lessons in my collaborative work supporting students with disabilities in K–12 classrooms, and as an advisor of a photography club for teenagers with disabilities, and I’ve seen its benefits in both situations. 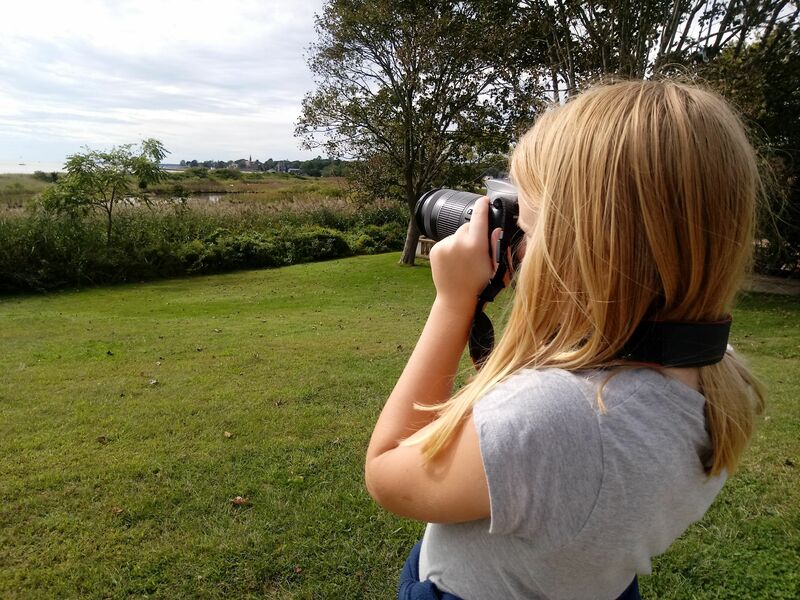 In addition to improving engagement, photography provides autistic students with a subject that’s accessible and allows them to participate actively and inclusively alongside their peers. As a hobby photographer, I understand the appeal of looking at the world through the camera lens, and I take my passion into the classroom when I introduce photography to my students. Photography can be an innovative way to help students with disabilities, particularly those on the autism spectrum, appreciate and highlight their creative perspectives. Photography allows us to access intentional, social, and task-focused engagement, but art can be intimidating for autistic students, who may prefer rigidity, structure, and clear definitions of correct and incorrect work. To help students feel comfortable with art and photography, I model the creative process, verbalizing my thoughts and reflection process to show students flexibility in the decision-making process of how I choose subjects to photograph. I believe that modeling my thoughts and reflective process is an example of Universal Design for Learning. I also demonstrate how to orally present and explain their photos to the class. Public speaking is a skill that connects students, and practicing it allows autistic students to socially interact with and speak directly to an audience of their peers. They are given a voice and a platform where others will listen. Speaking to the class allows these students to personally and publicly share their thoughts and their message, and I’ve witnessed powerful classroom moments when a student’s story about their photo elicits emotions in others, providing an “aha” moment of understanding between students. 1. Photography encourages independence: Many autistic students have challenges socializing with their peers and recognizing social cues and nonverbal signals such as body language and facial expressions. These students, and others whose disability affects their ability to collaborate with peers and participate in group projects, are given greater opportunity for success with photography, which allows them work on their own. The art of photography relies on the relationship between the photographer and his or her camera—taking photographs independently is a socially accepted behavior, and doing so can be very comfortable for students with disabilities. 2. Students’ creative and unique perspectives are valued and empowered: Photography, as an art, is about using widely available tools to capture something unique or original—something other people with the same tools have overlooked. Autistic students often have a strength in this area because of their outside-the-box thinking and unique perspectives. As a teacher, I ask all students to take risks and photograph something unique. My ASD students often think about assignments in different ways than I intended, and in photography this outside-the-box thinking is highly encouraged. I’ve had students take pictures of their toy action figures, the clouds, and their favorite pets. Students learn there’s more than one way to be beautiful, and engaging with other people’s perspectives helps autistic students practice flexibility. Other photo topics for older students that encourage flexible, abstract thinking include happiness, conflict, and peace. 4. Students improve their communication skills: After they take pictures on a given topic—color, circles, water, texture, etc.—I ask students to share why they chose to take each picture, which is just as important as what they photographed. Sometimes they initially say, “I don’t know why I like this picture,” but their thoughts and communication skills become more honed as they understand my expectations. In some classes I ask students to write a reflection, but oral reflection also provides opportunities for demonstrating understanding. For example, students with learning disabilities such as dyslexia may feel more comfortable with an oral rather than a written presentation. Some students with anxiety may be hesitant about explaining their photo, but I model flexible thinking and allow variations in the way they present—they can stand, sit at their desks, or walk around. Every time I introduce photography to students and I see their excitement as they look through a camera lens, I’m encouraged. I believe that art and photography can engage students who otherwise may not feel included or inspired by education.